First off, I caved and joined twitter. So if you want to know what spices I am running low on, today is your lucky day. OK, now I’ll make with the cookies. It seems that Peanut Butter Pillows won this battle, but the war still rages and I’ll post a few more of your recipe requests in the next few weeks. Right now, though, let’s get down to business. This recipe come straight from the ska checkered oven mitted hands of Terry Hope Romero. Chocolate and peanut butter fans will totally stalk you once they get a bite of these classic chocolately cookies with a heart of sweet and salty peanut butter. We can’t deny impatience is rewarded here: these cookies when eaten warm just a few minutes out of the oven are dynamite. We use black cocoa powder because we happen to have it, but dutch processed or even regular cocoa powder would be A-OK. In a large mixing bowl combine oil, sugar, maple syrup, non-dairy milk and vanilla extract and mix until smooth. Sift in flour, cocoa powder, black cocoa if using, baking soda and salt. Mix to form a moist dough. Make the filling. In another mixing bowl beat together peanut butter, confectioner’s sugar, 2 tablespoons of soy creamer and vanilla extract to form a moist but firm dough. If peanut butter dough is too dry (as different natural peanut butters have different moisture content), stir in remaining tablespoon of non-dairy milk. If dough is too wet knead in a little extra powdered sugar. Preheat oven to 350°F. Line bakings sheet with parchment paper. Shape the cookies. Create the centers of the cookies by rolling the peanut butter dough into 24 balls. Scoop a generous tablespoon of chocolate dough, flatten into a disc and place a peanut butter ball in the center. Fold the sides of the chocolate dough up and around the peanut butter center and roll the chocolate ball into an smooth ball between your palms. Place on a sheet of waxed paper and repeat with remaining doughs. If desired gently flatten cookies a little, but this is not necessary. Place dough balls on lined baking sheets about 2 inches apart and bake for 10 minutes. Remove sheet from oven and let cookies for 5 minutes before moving to a wire rack to complete cooling. Store cookies in tightly covered container. If desired warm cookies in a microwave for 10 to 12 seconds before serving. Holy mother I need to make these! OH YES! These look wonderful! Chocolate and peanut butter won yet another recipe battle. Oh, my, these look INCREDIBLE! I just happen to love both chocolate AND peanut butter. . . .
My best friend and I are planning to make them tonight! Thanks for the recipe!! Thanks for sharing the recipe! I thought those cookies were quite intriguing (the chocolate/peanut butter combo is a classic, but the shape of the cookies seemed unusual to me), so I’m glad I’ll get to try them soon. Ooooh, I just thought of something: almond butter instead of the peanut butter! Oh yeah, that will be awesome! Those are beautiful. AND I have all of those ingredients, awesome!! Oh! Oh! Oh! and continue the ‘Oh’s for a few more lines! Peanut butter AND chocolate!!! I’ll be making these very soon. Losing weight? Moi? Not for another wee while, I’m afraid…. So we made them- they were just as you would expect from looking at the pictures- SO GOOD… Kind of like a chewy crunchy brownie stuffed with sweet peanut butter- perfect with a glass of cold soy milk! Our thoughts: why not make a BUNCH of different “pillow” cookies? We came up with Cherry Cheezecake Pillows, Coconut Caramel Pillows, etc. etc. etc. Yes we got a bit carried away LOL! Yum they look really good and I bet they taste divine. Yay! I’m so glad you posted this recipe! I was in despair, thinking I’d have to wait for the book to come out before I could eat these. These look so perfect! There is almost nothing better than the combination of chocolate and peanut butter. I love the “pillow” idea, thanks for sharing! recipe conversion from king arthur? they recommend freezing the pb filling to make it handle better. omg yours look so good!!! I’m in love with chocolate and peanut butter! thank you thank you thank you thank you thank you! this will be a good week. These were easy to make and easier to eat. But hard to share. Oh no, why did you have to write a recipe for cookies that I have all the ingredients for?! Now I have to make them!!! PB + chocolate = irresistible! Where do I acquire these ska checkered oven mitts? If Terry gets ’em, I get ’em too! OK, these cookies look amazing, but I still absolutely must have the recipe for the Magical Coconut Bars, also. Please? woah, thank you! i will have to try these this weekend!! Has anyone tried making cookies using just the chocolate dough recipe? YUM! Make sure to underbake them slightly so they stay slightly soft and chewy in the middle. Made them tonight. As with all Isa’s recipes they are flawless and exactly as they appear and are described here! SO GOOD! Oh, except I made them a little bit oblong shaped and am calling them PB Chocolate Eggs for Easter! i finally just got the time to make these! they are beyond awesome! thank you so much! me and some of my room mates made these. We ate so many of them that every time a new batch was finished the previous batch was all ready gone! Thank you so much for posting this fabulous recipe and sharing previews of your upcoming book. I can’t wait to buy it! Do you have an estimated release date? Veganomicon is solely responsible for my vegan-ness! I just made these yesterday. OH MY GOODNESS! Delicious. This is the most satisfying chocolatey-peanut buttery vegan recipe I have ever made. The peanut butter center tastes like a classier and higher-quality version of the center of a Reese’s peanut butter cup, and certainly less oily. The chocolately outer cookie has a wonderful chewy texture. I just got around to making these, and OMG they are soooooo good. They fill the void of long lost lust for Reese’s cups. These are really. really. really. good. I wasn’t even baking for myself, but yummmm! Strangely, I had a little trouble with the chocolate dough. I’ve never had a problem with an Isa/Terry recipe before so its gotta be something with my ingredients or my brain today… but I was wondering if anyone else had trouble keeping the chocolate dough together? It seemed to just totally fall apart. Luckily I was baking at my parents house so my dad finagled a solution (extra flour at the end and a large splash of water) but I’m still not sure what happened. I think I gained 3 pounds just looking at this post! Those are gorgeous. Hey kpepper, you did the right thing! Since we don’t weigh the ingredients the amount of flour can be off. With this dough, I think a little splash of water was just what the doctor ordered to make it come together. Ok, I just tried this. Heaven! Isa, I think you need to start paying for my gym membership! You are too tempting! Made these this past week for my small group… OMG so good and everyone went crazy over them. I found the chocolate dough a bit oily but I’m not sure I was 100 percent on the measurement. This is a keeper fo’ sho’. I just made these and OH MY GOD. Incredibly easy and So. Good. If you had trouble with the dough coming together, make sure you mix these by hand. I’ve had lots of trouble before with being lazy and making cookie dough in the electric mixer and it almost always ends up crumbly. I mixed my chocolate dough with a regular table spoon and had no trouble with it. It does get a little soft and oily with handling, but popping it into the fridge between batches firmed it back up. i made these tonight, i didn’t have natural peanut butter or maple syrup so i used regular peanut butter and corn syrup. they turned out really tasty but the peanut butter melted a lot. next time i’ll follow the recipe better but for making them the first time they were great! YUM! These are the devil…we ate the whole batch in a day! I’m eating one of these heavenly peanut buttery creations right now! Holy moly!!!! I just finished baking these. They are my new favorite cookies! These are terrific! I just made them for a bake sale (in possibly the least vegan friendly town in the US) and they were a hit! After ten minutes, the plate of 24 cookies was cleared and I had woman leave her number to ask for the recipe. Thanks for these great cookies! These cookies are delicious and very easy to do to! Thanks! This is a seriously great recipe. The directions are great, the cookies are fun to assemble, and they turned out perfectly. So delicious! Thank you! These are awesome! The only trouble I had was that they flattened into the shape of regular cookies. They were still delicious but I am wondering why they dropped. Oh man these turned out great! I used Agave instead of maple cause that’s what I had around. I really like that there isn’t any hard to find ingredients in this recipe. One of my co-workers has asked me to pass on any Vegan baking recipes as her son is allergic to both milk and eggs. I’m gonna take her some tomorrow to try, see what she thinks. wahooo! these cookies rock my world! but i have one small suggestion. i made my peanut butter balls like a good boy but i kind of ran out of the chocolate part when i got to 20 cookies (don’t worry i ate the 4 remaining peanut butter balls 😀 ). if you add the instruction to separate the chocolate batter into halves? quarters? so you have a better idea of how to portion it out i think it would help. These were yummy. Fiancee took them in to work for the guys and they were devoured. They did not look nearly as pretty as yours though, did I do something wrong? These cookies are delicious! I made them for Christmas for my friends and family and everyone loved them. Why was my chocolate dough so sticky?!?!? It was freakishly, freakishly sticky and soooo hard to work with, so these cookies ended up being extremely difficult to make because I kept having to put the dough in the fridge to even get it a tiny bit workable, but then of course as soon as I touched it it started warming up again, so I could only roll maybe 3 cookies at a time. I followed the recipe to a T, so I don’t know what happened. To Erika: It’s a sticky, gooey dough, and it sort of needs to be to stretch over the peanut butter and be thin enough to make a nice cookie on the outside. I made the chocolate discs by flattening the dough into my palm (the child depositing the peanut butter into the center), making the seam at the top and plopping them seam-down onto the cookie sheets. Making the discs on a surface and then doing it would have been impossible. Also, I had to clean my hands down halfway through. If that doesn’t work for you, try adding another tablespoon of cocoa to stiffen the dough a bit. Chocolates and peanut butter – two of kitchen’s greatest inventions! Thanks for sharing them, I really love your blog. I made these on the weekend and was surprised by a) how much they looked like the cookie in the picture b) how not complicated they were because I thought it would be hard to get the pb inside the choco dough and c) how effing delicious they were. i miss reeses’ cups but these are sooo much better i’m so over it. agreed with the person who said to portion up the dough AND the peanut butter balls so you don’t have left overs of one and not the other. THANK YOU ISA! YUM! YUM! YUM! These cookies are incredible and mine looked just like they do in the picture…I baked them for my boyfriend and the next morning he told me he loved me for the first time…coincidence? I just made these with almond instead of peanut butter, they are spectacular. Actually, I just gave them an 11/10 on my blog! I’m totally going to make these! Thanks!!! These were very good. I made them with almond butter (thanks for the idea Josiane!) because I just don’t like natural peanut butter. Also added some almond extract to the filling. Time-consuming to make, but worth it. I need this book now! Although I think they look more like UFOs than pillows. Isa and Terry you have turned me into a freakin fantastic baker ! This looks amazing. I’m going to make it for a dinner party tomorrow night. A question: any suggestions for making this without refined sugar? Could I substitute brown rice syrup or something for the sugar? WOW. I do believe that I have found my cookie nirvana — chocolate, peanut butter, and vegan, all in one absolutely amazing cookie. I think these are actually the best (vegan or not) chocolate peanut butter cookies I’ve ever had. I rarely bake the same recipe twice (so many recipes, so little time), but these will without any doubt be getting baked again. I have a feeling I’m also going to be investing in the book soon enough. I just made these. So f-ing good. My mouth jizzed everywhere. Simply delicious! I’ll get all the ingredients and test them tomorrow! I try this with my two children over the weekend. It is a wonderful process. However, the result did not turn out well because we did not control the heat correctly. But it became a great bonding process. These were delicious! I only had olive (not canola) oil and molasses (not maple syrup), but those subs worked fine–I think the molasses (plus the raw sugar I used in place of usual granulated sugar) was a strong enough flavor to get rid of the olive oily taste. Also, I put cinnamon in the filling, which is a great addition. These were delicious! My whole omni family, who are usually very critical of anything vegan, all loved them. These are incredible! The only thing I want anyone who is going to make these to know is to not use room temperature peanut butter. I have made it with both room temp and chilled peanut butter and the cookies are much less greasy/oily when the peanut butter is chilled. I had to throw out an entire batch and start over because the dough was SUPER oily, i even added extra powdered sugar, but it didn’t help. Thought I’d pass this on so everyone can learn from my mistake 🙂 GREAT RECIPE – my vegan hater of a brother in law LOVES these cookies! My husband and I made these last night. They are so fantastic! This is the first recipe we’ve made from “Vegan Cookies Invade Your Cookie Jar”, and this alone made the purchase worth it! My friends are begging for the recipe! Have just baked my first batch, eaten four already. These are IMMENSE!!!! Thank you so much! hi! i just had a question. i swear i followed this recipe to the t! but both the cookie mix and the cookies themselves tasted TERRIBLE. i feel like i did something wrong, and i really feel it was the baking soda. i just want to make sure that it is infact supposed to be baking soda and not baking powder? because they really tasted just like baking soda should, i would assume. if you have any suggestions i would greatly appreciate them! thank you so much!! O.M.G. WOW these are good! Made them yesterday to mail off to family for Christmas! Made the Mocha Chip Muffins too and they’re amazing as well! DO NOT USE CANOLA OIL unless you’re a fan of trans fats. That stuff is pure garbage and is, sadly, marketed as beneficial to heart health when it does the complete opposite. In how it’s processed, it’s heated at high temperatures and deodorized, thus turning any positives about it into extreme negatives. many thanks for this recipe. the assembly was fun and the dough handles very well! made some round and flattened others…just to see. My chocolate dough turned out weird and grainy (kind of like Play Doh with sand in it?) It fell apart very easily and adding more almond milk just made it sticky. Adding more flour made it fall apart again. I used raw sugar… could that have contributed? I can’t stop eating these!!! I am NOT a fan of chocolate…. and only eat peanut butter when it is baked as a cookie, but these were amazing!! These are great, just made them… I squished mine down into more of a cookies shape. The dough is much easier to work with after resting in the fridge for 15 mins. before shaping the cookies. I had to make double the amount of chocolate batter, so maybe I’m just really bad at flattening the dough. 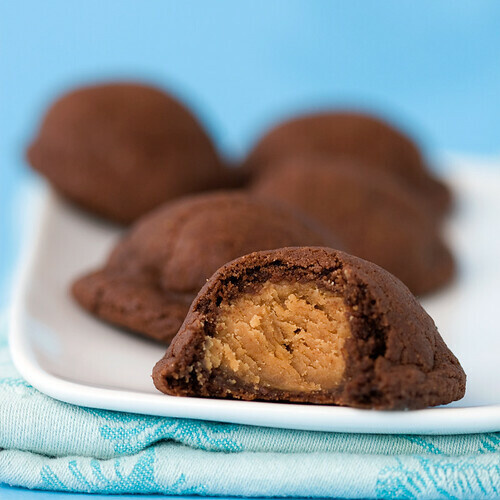 I compensated by making double the amount of peanut butter filling balls and doubling the amount of cookies so we wouldn’t all get fat (although it IS hard to just eat one)….So YUMMY! Seriously – this is ridiculous. How the hell am I supposed to make these cookies when I can’t stop eating the chocolate dough? Wow, just found the site. These are going to have to be made tomorrow. 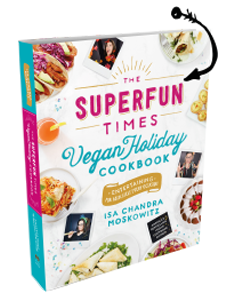 I’ve been looking for a decent Vegan cookbook and I’ll have to go get your latest! Ok, a question– I don’t have any unsweetened cocoa powder in the house, but I do have (IT WAS GIVEN TO ME!) a container of powdered Nestle Quik. Anyone think it’ll work decently if I use that, and cut back on the sugar in the cookie batter? Nah, aesthetics aside, it won’t be chocolatey enough. Just made these (um I didn’t use the Nestle Quik, thanks Isa 🙂 and they are ridiculously divinely delicious. But I’m wondering if it’s really necessary to add sugar to the PB filling? Would it work to just use a small ball of the plain ol’ PB without adding anything, or is there a baking-related reason it needs to stay in there? Confectioners sugar is vegan? I thought it was processed with bone char. These are weepingly delicious; little mouthfuls of peanut buttery heaven. And they turned out exactly like the picture, which is oddly gratifying. I feel that anyone who eats these could go on to do great things. Or achieve world peace. Thank you! Some are, some arent. You have to check into which ones are. would love the chocolate dough portioned out. i had a lot of extra peanut butter batter. i ended up rolling out more than 24 balls but didn’t have enough chocolate dough. and it was a little falling-apart-y. will try the flour+water trick. other ideas? for achieving the correct number? y’know… after looking at the picture, i’ll be using a MUCH less a amount of chocolate dough next time. they won’t fall apart as i girl-handle them? Thank you for the awesome recipe. I am a newborn vegan, and it was such a joy to inhale the batter without risk of salmonella poisoning! I just made these, and they’re super delicious. As other people said, the peanut butter is a little oily (even after chilling it and adding extra sugar) and the chocolate dough is crumbly, but if you just stick with it, they’re amazeballs. As far as not having enough chocolate, I divided the chocolate into 24 balls before assembling any of the cookies, so I knew I’d have the right amount, and it worked out perfectly!! I just made these cookies and they are sooooooo delicious. We started eating the pb rolls along the way before putting them in the oven.. perfect combination.. Aloha from the Big Island of Hawaii! Great recipe! The peanut butter filling came out much better & less oily the second time when I made it with no-stir natural peanut butter. The chocolate dough didn’t come out quite like a dough. It was very grainy due to the sugar granules which never seemed to incorporate into the mixture. Therefore, the cookies didn’t hold their shape. However, they tasted delicious! Next time, I will make sure to use different flour and see if that contributed to the texture problem. However, the graininess was apparent before i added the flour to the chocolate dough mixture. What could have happened??? If I double the recipe, should I also double the filling? I just made these and also had no problems! I had to make a dessert for a dinner we’re going to but didn’t feel like going to the store and these were the PERFECT solution!! I had planned on making 2 different cookies but I had no idea how large these were (about 1.5 inches when they were done baking), and they will definitely be enough to satisfy. Some Tricks: I only had unsalted unsweetened peanut butter, so I added 1/8 teaspoon of salt to my filling. I made the peanut butter balls first and put them in the fridge, then I made my dough. Yes, the dough was very soft, but I found that it made it SO much easier to work with. I made them into discs in the palm of my hand, then placed the peanut butter ball inside and wrapped up the edges around the ball. Then I rolled them between my hands and any of the breaking was smoothed, as well as any gaps in the chocolate cover. I can’t wait for everyone else to try these – they really do taste like stuffed brownies! SO good. Whats up! I simply want to give an enormous thumbs up for the nice data you will have right here on this post. I will be coming back to your blog for more soon. I just finished making these! Let me just say they are ABSOLUTELY AMAZING! A peanut butter chocolate brownie. Comfort in your mouth. I went with some of Elizabeth’s suggestions and I must say it did make things much easier! I noticed that my chocolate dough did start to get a little crumbly toward the end but they turned out just fine. Mine definitely don’t look as pretty as the picture, but they are so delicious and so filling. You only need one and you’re in heaven! Thanks so much for this recipe! Just after examine several of the content on your web site these couple of days, so i truly like your style of blogging. I bookmarked it to my favorite features website list and will be looking at back soon. I made these cookies last night. They were very easy to make with ingredients that are normally in the pantry. I was planning on making two batches of the chocolate dough since a few comments were made that there wasn’t enough, but I didn’t end up having enough ingredients so I only made the amount in the recipe. I didn’t have maple syrup or natural peanut butter, so I just substituted light corn syrup and JIF extra crunchy peanut butter. Also, I didn’t sift the dry ingredients since I don’t have a sifter. The dough tasted very good, so I knew that the baked cookies had to be delicious! Before I started rolling the peanut butter balls, I used an ice cream scoop to divide the dough, and found that it yielded 12 cookies. I divided each ice cream scoop of peanut butter dough into two, which yielded 24 cookies. I did the same with the chocolate dough so that the amount would be even. By doing this, there was just the right amount of dough and filling to yield 24 cookies, so I’m glad I didn’t double the chocolate dough! I tried a cookie a few minutes after cooling right out of the oven, but found they were too sweet. I kept the cookies in the refrigerator for a few hours in an air tight container, and they were so delicious! I highly recommend this recipe!! The only negative is that they are a little time consuming, but it is worth it! » VeganMoFo: Carrie Don’t Eat Off The Sidewalk! I just made these for my husband who was craving an evening snack and they are wonderful! They taste delicious and were very easy to make. I always worry about altitude up here at 7500′ but it wasn’t an issue with this recipe. MoFo #20: I prefer my desserts in threes « Hot vegan chick…..peas! I made these for the party and they rocked! Thank you for the recipe! Beautiful! I’m going to try this GF. I made these cookies this evening as a test run for the holidays. I found that there was not enough chocolate dough for 24 cookies, so next time I’ll double the recipe. They are delicious! Instead of using regular bleached sugar, I used organic cane sugar which is courser. I think this may have effected the consistency of the dough because when I rolled the dough over the peanut butter balls, it was crumbly. Any suggestions on what to do about this without using the white sugar? I made these cookies on thanksgiving for 3 different houses. They were a BIG hit. So easy I made two batches. It is more tedious to divide the chocolate dough and peanut butter dough into 24 balls each, but do it-it is worth it for consistancy. Sooooo yummy I will make them again. I can tell by how many comments I had to scroll through to get to the bottom that everyone is thinking the same thing I am. My chocolate dough was very oily, but turned out fine after baking, and I had to add a little more sugar to the pb mixture. I think these are going to become a staple in my repertoire! awesome! just make sure its vegan confectioners sugar, most white sugar is processed with charred animal bones. Peanut Butter & Chocolate Cookies - 2 ways! And yes I did just shout that out loud from the window. What if I don’t have any non-dairy milk?? I live in the middle of the sticks & the closest store to me does not have non-dairy milk. I shouldn’t be surprised because the town the store is in only have 250 people in it, but I can’t drive and hour & a half, just for non-dairy milk. What can I use instead? A magic cookie recipe! These were so easy to make, and turned out so fantastic; the perfect mix of sometimes crunchy sometimes soft and chewy cookie. My only refinement was that I divided both dough and filling ’til I had 24 of each, then it was just like an assembly line, super-speedy. Will definitely make again, and would make for a gift. These were amazing. My bf craves Reese’s PB cups and misses them so much– these are a perfect way to satisfy that craving! We couldn’t find smooth natural PB at the store today, so they were made with smooth conventional PB, and they turned out just fine. Also, for everyone having problems with the amount of dough and the dough being too oily to shape, I recommend using a Tbsp measure and by “generous” Tbsp. think like– giving socks to your family for Christmas generous– just barely round the Tbsp and you’ll have plenty. To help handle the chocolate dough, I washed my hands in cold water every 6 cookies or so, and that helped a ton. I also found that, even if it seemed like the dough was breaking and wasn’t enough, the dough evened out perfectly as I started rolling my hands quickly to form the ball. These handle a lot like the Rumnog Pecan Cookies in Veganomicon (which are awesome, as well)– the dough feels really loose, but you if you have faith and roll them and go with it, they cook great. @Katie: If you have almonds, make your own almond milk. So easy. Google for instructions. If you don’t sometimes water will work too, but I dont know in this recipe. Thank you so much Isa, cant wait to try these. Do you have any tips on making these gluten free? I make them all the time and I have a gluten-intolerant friend who really wants to try them. these are incredible! getting the chocolate dough around the peanut butter balls was definitely a bit challenging as the dough is pretty much at its plasticity limit… eventually worked it out but it was very time consuming. any tips on how to speed this step up? I think that the temp of the dough probably matters. If it’s very cold it will be harder to roll. Perhaps put it in your warmest room for a few minutes before forming the pillows. Great web site. Many valuable data right here. I sure am mailing it to some close friends ans also revealing in delicious. Of course, thanks for your sweat! I made these as a valentine’s day present for my decidedly omnivorous boyfriend-he practically made himself sick devouring them! Baketivism at its finest, as far as I’m concerned. I’m a vegetarian, not a vegan, but your recipes are convincing me that I can do deliciously without eggs and milk. Keep them coming! I substituted agave for the maple as well & added mini Enjoy Life chocolate chips to the filling….AMAZING! I was excited when I saw these and realized that I had everything in my pantry. I found them easy to make (had the extra cookie sheet on top of the stove so the dough was soft to roll) and myself and both my sons loved them! I did cut the sugar back by 1/4 cup and added 1/4 cup more of cocoa and 1/4 cup more of flour to compensate. It amazed me how well my boys liked because they are usually pretty cautious about my vegan baked goods. When my 15 year old’s friends came, they liked them as well! Thanks!!! So incredibly rich and delicious I could only eat two, washed down with a big glass of milk. I’m an omnivore, but was searching for an eggless recipe to serve a guest with food sensitivities. They were a gooey and delicious hit, and easy to make at that. This will be a new regular for me. Thank you for the terrific recipe! These were ok. Way too much sugar, not enough cocoa. Made these t’other day but missed out the baking powder by mistake and ended up with these amazing cookies with a peanut filling, like a chocolate peanut butter cookie sandwich. So i’d totally recommend trying it this way too. These are the best cookies in the world. Thank you so much for inventing them. I bring them to every pot-luck as an ambassador of vegan goodness. People go NUTS for them! I recently made a gluten free version which is quite satisfying: Use entirely brown sugar rather than white, double the vanilla, and use Bob’s Red Mill gluten free biscuit and baking mix for the flour. The cookies are moist and almost indistinguishable from those with gluten. clarification of the above gluten free variation: I substitute the brown sugar for white in the chocolate dough, but not the pb dough – for that I still used confectioners sugar. Just made these! Fabulous recipe, super duper easy to follow!!! They turned out really really well, just like in the picture (yay!) I substituted PB for almond butter (because a good friend I have every intention of feeding cookies too is allergic to PB!) and it turned out just fine! Can’t wait to try it with peanut butter though, I’m a sucker for the taste! Just curious to how you feel the dough would freeze? I was going to try making a bunch and pre-rolling them and then freezing it so I can just plop ’em out and bake them? Can Carob powder be used in lieu of the cocoa powder? Non-dairy milk is soy milk or almond milk or rice milk or coconut milk etc, any milk that does not come from an animal is what she means. You don’t have to use both non-dairy milk and soy creamer, just pick either the non-dairy milk or the creamer if you would rather use that. I just made these with gluten free flour, and sunbutter. My friends little girl has gluten, dairy, and peanut allergies. The chocolate dough was too wet for cookies, so I spread half in an 8×8 pan lined with parchment, spread the sunbutter dough on top then the rest of the chocolate, and baked for 40 minutes! OH MY…tastes like chocolate sunbutter brownies! Soooooo yummy! Well, these are dreamy. 3x’s the recipe for a bake sale! How long would you store this for? this recipe deserves a slow clap. i am amazed with how delicious these are. i baked a batch for my non vegan/vegetarian friends and they all absolutely loved them. thank you for helping me spread the vegan love. I made these successfully gluten free with a combination of 1/2 c. Almond Flour, 1/2 c. Sorghum Flour, 1/2 c. Tapioca Starch, & 3/8 tsp of Xanthum Gum. Thank you for the great recipe! These are the best. I make them all the time for friends and family. My work is having a cookie exchange this weekend, and I am making these as in christmas tree shaped silicone baking molds. I am so excited to share these with the ladies at work!! These are good, but the chocolate dough was way too wet. I think this is a result of weighing the flour to be 180g instead of using a cup and pressing the flour into it. The chocolate dough really spread out into flying saucers. They don’t look much like your picture. Don’t know if I’ll try these again. Your plain peanut butter cookies are to die for though, especially subbing maple syrup for the mollasses. Looking forward to trying more of the recipes in the book as my waistline allows. I was lazily craving some decadence, so I mixed up a quarter batch of the peanut butter filling, mixed with chocolate chips, and am eating it with a spoon. This was a too-lazy-to-actually-bake win! I baked my cookies for around 15 minuets, otherwise they weren’t done. My chocolate dough was also a little hard to shape around the filing, but these are really great. Good recipe to try! Dis was not easy. And they kind of looked like poos. But idk I’m stupid. Just made these gluten free with a homemade combination oat/rice flour and cutting the sugar in half! I also used agave instead of maple syrup. They’re sooooooooo tasty!! My family and I recently went vegan so we are still looking for good stuff and these cookies were perfect! Thank you so much…great site! Can you make these with almond butter instead of peanut butter? Thank you for this divine recipe. I’m not vegan, but I made these for a vegan friend and some non-vegan friends and everybody was very pleased with them. I found the dough too oily and a bit difficult to handle – I might add more flour or ground oats to the dough next time. Refrigerating the mix helped a bit. My cooking time was longer because I don’t like soft cookies. All in all, a fabulous, delicious treat. I made these last night and brought them to work today. I waited until people tasted them before I told them it was from a vegan recipe. Nobody could believe it. They were a hit! Thanks so much for sharing. these were fantastic. My girlfriend and I just made a batch. Yummy. Thank you. These were delicious! I made cookies for friends and didn’t tell everyone they were vegan, but they were a hit. Fortunately, they didn’t eat them all. They also had a great consistency and stayed fresh a week later (they were gone after that anyway). I will definitely make these again. Easy to make too. Thanks for a great recipe! As if these need any more any rave comments, THESE ARE ABSOLUTELY AMAZING!!! By far the best cookies I’ve made, vegan or not. All of my non-vegan friends love these as well and I get asked to make them ALL THE TIME. Highly recommend!! I use unsalted peanut butter myself. They come out wonderfully delicious and scrumptious. Not enough positive adjectives to describe these! I’ve made these myself before, and ladies at the synagogue in my old town used to make them for events (! ), and now I must tell you: yesterday we saw these being served (and ordered them for goodness sake!) at a vegan restaurant in Tel Aviv. You have reached the world! Does using whole wheat flour instead of all purpose work well? might i make these with coconut or another oil? canola is really not a healthy option. I tend to stay away from it. Made these for vegan guests and they are fantastic, will definitely add to the regular rotation. For those having trouble with the chocolate dough, I found refrigerating it before shaping made it easier to work with. When it got too soft, I took a break and put it back in the fridge. My roomie made these for me, and they were delicious. I found these a few months ago and have made them numerous times! SO good. Guess I’ll just book mark this site. Oil your hands. Rub some canola oil on your hands or else it’ll stick to your palms. Continuously do so after every few balls. I oiled my entire hands so I could just oil my palms by using the back of my hand. Then bake as the recipe says. Mine came out perfect pillows with no side effects from the oily palms. Makes flattening and forming the balls much easier. It’s a trick I read about from another recipe before. I made these cookies for my friend who is vegan and she loved them! The surprising thing was that her mother who does not like anything absolutely fell in love with them and kept on sneaking them! This is my favorite go to cookie recipe for my friend! WIAW Gardein Review and Giveaway! » Carrie Lights! Camera! Vegan! Have you ever doubled or tripled this recipe, Isa? I’m going to make these for a cookie exchange and I need 66 cookies. Thanks! These cookies are AMAZING! My 7 year old granddaughter and I just made them with a little “help” from her brother, my 3 year old grandson. We had a great time, they are super easy to build once the dough and the filling are created and they are delicious. I used coconut oil, Trader Joe’s natural peanut butter with no added salt or sugar and 1/2 cup regular white sugar (because i want to finish it) and 1/2 cup Florida Crystals, because they are cruelty free. Thank you for this wonderful recipe; definitely adding it to my cookie repertoire. Does it freeze well? Hope so! about different types of gifts, so that you can choose easily. yours is the best I have found out till now. But, what concerning the bottom line? Thank you so much for this recipe! These are now my go-to cookie for special events/anytime and everybody always loves them and asks for the recipe. A small modification I make is to smash the peanut butter layer flat, add a small amount of jam, then roll that into a ball before wrapping it in the chocolate layer. Thanks again for this and all your other recipes! THESE ARE THE BEST COOKIES ON THE INTERNET!!! I’ve been making them for years and they are always a success! Soooo glad I found these yummy and very addictive chocolates cookies with a soft nutty center! I made them with almond butter instead of the peanut butter and they were a hit! Thank you! I made these cookies for a party and they were a hit! People were really impressed, asking how I got the peanut butter in there – they look very professional~ I didn’t realize they’d be kind of little labor intensive with the dough but then the baking time is very quick to make up for it. I thought they tasted best around 24 hours after making them. We made these many, many moons ago when we had two children. I now have 4 children and am bringing them back as an ode to the fluffy, pillowy snow we are getting in April. Also, Feast Of Unleavened Bread is upon us so, no baking soda, no problem. This site is really very interesting. You have provided such a great information. Keep it up.